Google always surprise us by introducing newer user-friendly features. Right now they have introduced a new feature called Google Instant Search. It gives us results even before we finish typing our search query and it shows most relevant results by analyzing the keywords we type instantly. So practically, Search Engine is not waiting for us to press enter key to show us the results for our search query. Google claims, its new feature helps us to save our time searching by providing instant search results even before we finish typing. The first beneficiary of this new feature was US users but now it is extended to all users. Currently, not all browsers support this feature. Following browsers support Google Instant without any issue. They say the new feature will not consume too much Internet bandwidth because the flow of data for it is too small. For a slower network, Google instant will be disabled automatically. So practically there won't be any different for a user who uses the slower Internet connection. He will see the traditional page where he has to complete the entire query and press enter to see results. Some users may not be happy to see results before completing their query. You can disable Google Instant on a computer if you are not happy with this new feature. To turn off this feature follow the steps mentioned below. Click on Settings under the right-hand side of Google Search. This image will help you to find settings. 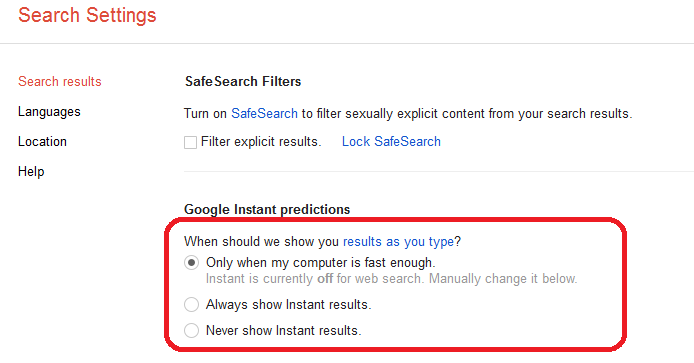 If you are facing issues with showing results without completing the query on your computer, you should choose the option "Always Show Instant Results". However, if you have a slower Internet connection, I suggest you turn off it on your computer.